Kelvin Ferbianto and Nebiyu Bachore get some studying in on Reading Day. 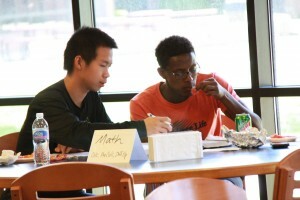 May 2 was Reading Day this semester, marking a change from the typical Monday-before-finals schedule. The change has taken many students by surprise, but there were several reasons for the change. But what’s good for profs may not be great for students. First of all, students who use Reading Day to study for exams may need to change their studying strategies. In the past I have always used reading day to finish projects and get my last minute questions answered by professors. With many profs leaving their offices early on Fridays, how will students get those questions answered this semester? Sure, there are some professors who will not mind students contacting them on Sunday to answer questions, but the majority of professors will want their Sunday to themselves. Complicating matters even more is the LarkFest award ceremony, which used to be held during commencement weekend. Reading Day is supposed to dedicated to studying, but LarkFest’s 11 a.m. scheduling splits the day. It interrupts studying. Additionally, the Campus Cup, also be held on May 2 providing even more distraction. Finally, there is the issue of spring sports. Reading Day typically does not interfere with any spring sports tournaments, but moving Reading Day from Monday, May 5 to Friday, May 2 creates a conflict. May 2 is the day of the Men’s Baseball Regional Tournament. This means that the baseball team, myself included, will have no benefit from any of the study groups or study sessions that are happening on campus. If we want to talk to tutors we must hope that they have free time in their busy weekend schedule to set up a time to study. Reading Day for the spring semester of 2014 is cluttered with activities and school sponsored events when it should be focused on a day of rest and preparation for finals week. In years to come, I hope administrators remember the original purpose of Reading Day and consider moving it back to Monday.